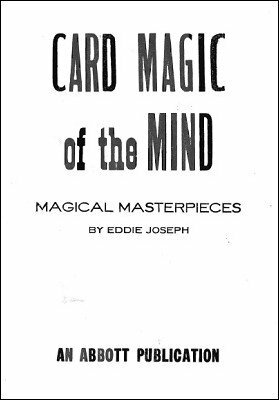 Fourteen mind magic routines with a deck of cards. Just because one has acquired extreme dexterity in the manipulation department it does not stand to reason that CARD MAGIC OF THE MIND can be easily presented as a bunch of tricks. The Magician appears in the role of a Mentalist when doing CARD MAGIC OF THE MIND. He is supposed to be working with his MIND and not his HANDS. Any attempt at speed or undue display of manual dexterity will ruin the whole thing. One should remember to keep it that way. 1st edition 1952, 42 pages; PDF 46 pages. Great ideas. Even today great lessons for learning presentation for mentalism.